The Medieval time period completely altered the art of siege as it was known to the ancient world, even though in the beginning medieval siege-works shared many parallels to that of Rome. In the Dark/Early Middle Ages (c.a. 600 – 900 A.D.), there seems to be the continued theme of reluctance toward siege warfare due to its large expenses and overall lack of success. Long term sieges were avoided, and hardly ever established (Nossov, 2005). This is confirmed by noting the low numbers of siege engines used and the substitution of proper siege procedure with shallow stratagems as a quick ploy for victory (although such tactics were often effective). Siege warfare, during this time period, was still used but lacked the enthusiasm necessary for great success. The problem, as it was in Rome, was that siege works was very costly and there still was not sufficient technology to easily and effectively overrun the enemy. The penalties from siege battles were often far more severe than the dividends. So what happened to this form of warfare over the course of the Medieval Age? In the beginning the progression of tactics and technology was slow moving, often imitating classical Roman tactics such as the testudo formation. However, there were several major advances that occurred in these few hundred years that would forward the art of siege-craft forever. Between c.a. 1000 – 1400 A.D. sieges were not centered about a town, instead, the new focus became the much more manageable castle. This movement from town to castle completely altered the nature of siege tactics and technology. Combat was now far more direct and focused, making sieges more tactful and manageable. In addition, a breakthrough in weapon engineering in the 12th century A.D. produced the high esteemed Trebuchet. This powerhouse allowed armies to make quick work of a city or castle wall as its ability to rapid fire far exceeded its predecessor, The Perriere (Nossov, 2005). Sieges were shifting from long, drawn out ambiguous blockades to tactful and far faster paced battles. This shift from outer to inner city siege forced both the defensive and offensive parties to come up with completely new approaches to invasion and defense strategies altogether. As a counter measure to the spike in offensive machinery, we begin to see castle and city walls becoming immensely thick to hold up against the constant projection fire about perimeter during an attack. In Medieval time’s, fortifications, usually castles, were the main target and they were not taken down easily (McGlynn, 1994). As a matter of fact, these fortified structures were almost always placed in locations that were very difficult to invade such as swampy/moat surroundings or mountainous climates. Although the siege of a castle is seemingly far more malleable than that of a city, the defensive considerations by the besieged made a proper siege far from easy to handle. For example, defense towers littered along castle walls built on bedrock to hinder undermining may prove to be difficult to handle (Renoux, 2002). In accordance to such situations, a variety of siege machinery was used and developed to assist, including the somewhat dormant siege tower which made a comeback during this time. Bastille’s or defensive base camps were also established as a common area where the attacker could defend and strategize. These camps were usually placed in a strategic location to give them additional leverage in their attack as well as establish a solid blockade. In addition to the classic undermining, starving, storming, bombarding, treachery, and various negotiations, psychological warfare also came into play as a siege tactic at this time. This movement became possible with the revolutionary invention of the cannon (c.a. 1450 A.D.). Although in the beginning the cannon’s capabilities were nowhere near as powerful as some of the other siege engines, its potential was frightening to anyone who was faced with it. Initially used as a means of flaunting power, the cannon quickly revolutionized sieges into the type of warfare we are more familiar with in the modern age (Nossov, 2005). No longer were sieges several months or years, they were now were moving towards becoming a few months, several weeks, or days. At long last modern weaponry was reaching a point where the weapons could stand on their own against the enemy. No longer were long drawn out tactical considerations necessary, siege was becoming a science. By looking at the development of this form of war from Rome to the latter end of the Medieval Age, we can see the development of early modern war (McGlynn, 1994). The ideas passed from Rome to the Middle/Medieval times were built upon, specifically in the art of siege technology. It is very clear that although the tactics of battle fluctuated from case to case, we ultimately see a traumatic increase in technological advancement empowering the party with the better weapons for the job. Much like warfare today. McGlynn, Sean. 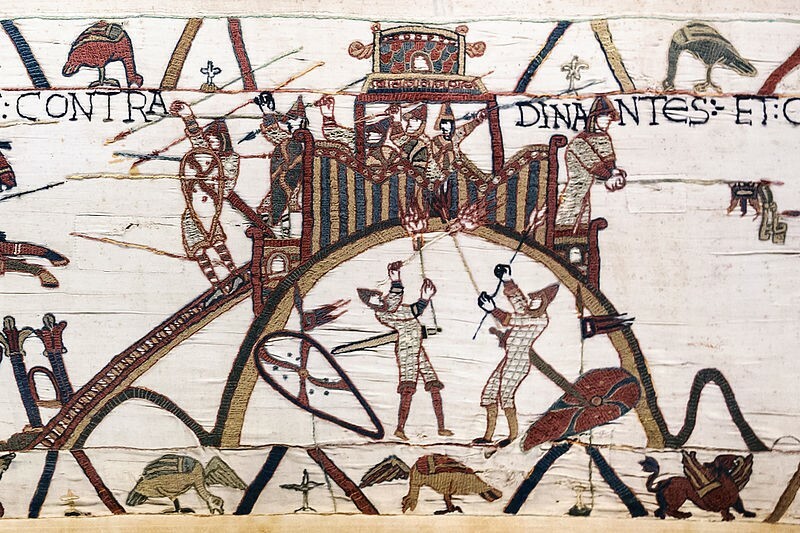 “The Myths of Medieval Warfare.” History Today. Vol. 44. 1994. Web. 3 April 2014. <http://www.knightorder.org.uk/history/The%20Myths%20of%20Medieval%20Warfare.docx>. “Medieval Warfare: How to Capture a Castle with Siegecraft.” MHQ. 12 June 2006. Web. 3 February 2014. <http://www.historynet.com/medieval-warfare-how-to-capture-a-castle-with-siegecraft.htm>. Nossov, Konstantin. Ancient and Medieval Siege Weapons. Guildford: The Lyons Press, 2005. Book. 3 April 2014. Renoux, Annie, and Lucia Velardi. “castle, fortification.” Encyclopedia of the Middle Ages. : James Clarke & Co, 2002. Oxford Reference. 2005. Date Accessed 3 Apr. 2014 <http://www.oxfordreference.com/view/10.1093/acref/9780227679319.001.0001/acref-9780227679319-e-495>. Thérouanne, Walter of. Uita domni Ioannis Morinensis Episcopi. Trans. Jeff Rider. 23 February 2014. Web. 3 April 2014. <http://deremilitari.org/2014/02/description-of-a-motte-and-bailey-castle-from-flanders-from-the-12th-century/>.